These are a traditional Polish treat, created in a vegan way to be enjoyed warm on a cold winter’s day. Mix the ingredients for the dough and allow to sit, covered for 15 minutes. Slice 4 of the plums in thin slices. Place the sliced plums in a small saucepan. Add 1 tablespoon sugar and the spices with about 3/4 cup of water. 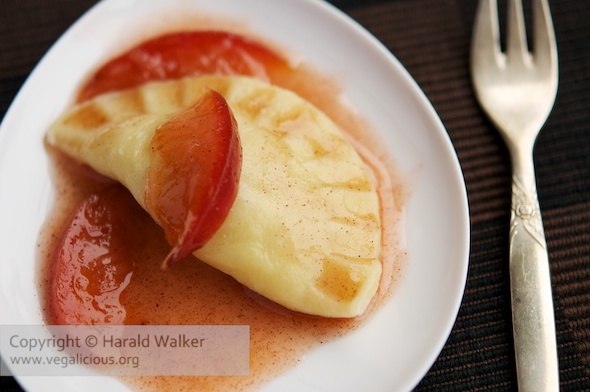 Bring to a soft simmer and cook until the plums are soft and there is a nice smooth sauce. Mix the lemon juice with the cornstarch and perhaps a bit more water. Add to the cooked plums to thicken the sauce. When the sauce is thick and clear, turn the heat down and keep warm on a low heat. Make 8 small balls from the dough. Roll the balls out to form small circles, about 1/4 of an inch thick. Slice the remaining plums in eights. Place 2 slices of plums with a 1/2 teaspoon of sugar on the center of the circle. Fold the circle over and crimp he edges closed. 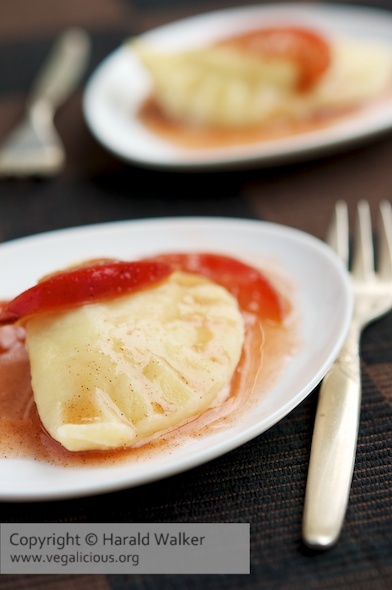 Put the plum pierogi in the boiling water and cook until they begin to float – about 3-5 minutes. 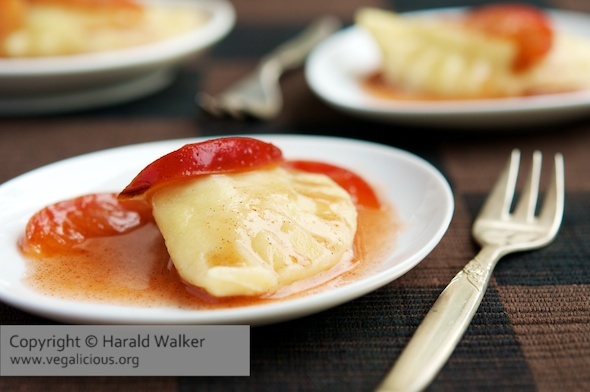 Serve the plum pierogi with some of the plum sauce. Posted by Chris Walker on December 17, 2010 in Desserts and Sweets, Plum.